On 14 November 2017, Gummi Falk found and photographed a male Two-barred Crossbill (Loxia leucoptera) at Seltjörn, south-west Iceland. It represented just the second national record of the species, following a male recorded in the far east of the country in August 2009. Gummi’s photographs showed the bird to be distinctively pinkish in colour and seemingly quite lightweight in structure, albeit with no other birds for direct comparison. Quite strikingly, it possessed a very long, slender and tapering bill, with the tip of the upper mandible apparently extending well beyond the tip of the lower mandible. These features, as well as the relatively fine white tips to the tertials, are all highly indicative of the Nearctic subspecies leucoptera, or ‘White-winged Crossbill’ – a taxon not previously recorded in the Western Palearctic. In comparison, Eurasian bifasciata is a slightly larger and more robust bird, with a heavier and squarer bill (often indistinguishable from Common Crossbill) and a crimson-red plumage. White-winged Crossbill Loxia leucoptera leucoptera, Sólbrekka/Seltjörn, SW Iceland, 14 November 2017 (Gummi Falk). 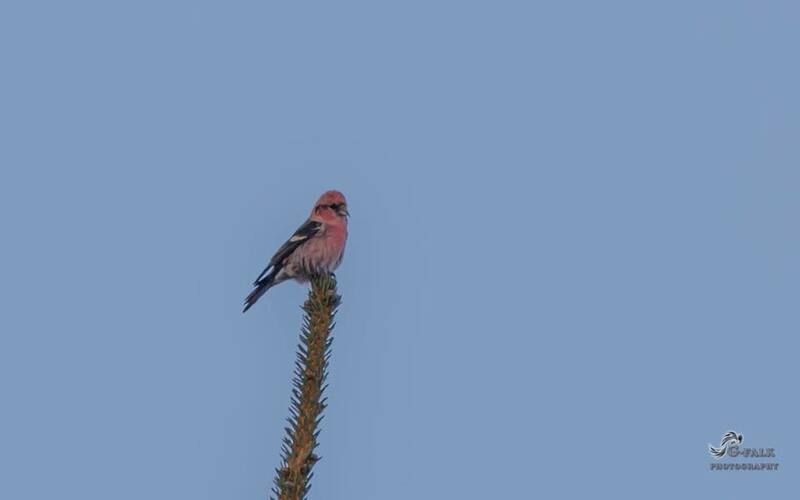 Given that just a few irrupting bifasciata Two-barred Crossbills had been noted in the Faroe Islands and Shetland in late July 2017 (with no records during the autumn) and considering the extreme westerly location of the Icelandic bird, the evidence further mounted in favour of Nearctic origin. But, to confirm the identification beyond all doubt, sound recordings were required. The differences in vocalisations between leucoptera and bifasciata, which are discernible in male and female birds of all ages, have long been documented; for example, a set of recordings, and accompanying descriptive sonograms, can be found in The Sound Approach to Birding (2006). Returning on 15 November, Gummi and Gunnar Hallgrimsson were able to relocate the bird and obtain better photos and, crucially, sound recordings. These were sent to Magnus Robb, who confirmed the identification. Here he explains his thinking and compares Gunnar’s recordings with examples from the Sound Approach archives. “Gunnar’s recordings contained three call-types, which I compared with examples of leucoptera that I recorded in Algonquin Provincial Park, Ontario, Canada and bifasciata I recorded in the Netherlands. The clearest indication of leucoptera can be found in the excitement calls of the Icelandic bird. Above: White-winged Crossbill Loxia leucoptera leucoptera, Sólbrekka/Seltjörn, SW Iceland, 15 November 2017 (Gunnar Thór Hallgrímsson). Excitement calls. “As you can now hear for yourself, these are pretty much identical to excitement calls from Ontario. Crucially, Two-barred Crossbill does not have any call closely resembling this in its repertoire. Above: White-winged Crossbill Loxia leucoptera leucoptera, Algonquin Provincial Park, Ontario, Canada, 6 August 2000 (Magnus Robb & The Sound Approach). Excitement calls. “Flight calls of leucoptera are given in rigidly structured bursts of two, three or four at a time, redpoll-style, whereas flight calls of bifasciata have a different shape and are either given one at a time or grouped much more loosely together. Compare those of the Iceland bird with Sound Approach examples from Canada and the Netherlands. Again, the Icelandic bird comes down clearly on the side of leucoptera. Above: White-winged Crossbill Loxia leucoptera leucoptera, Sólbrekka/Seltjörn, SW Iceland, 15 November 2017 (Gunnar Thór Hallgrímsson). Flight calls together with camera clicks. Above: White-winged Crossbill Loxia leucoptera leucoptera, Algonquin Provincial Park, Ontario, Canada, 7 August 2000 (Magnus Robb & The Sound Approach). Flight calls. Above: Two-barred Crossbill Loxia leucoptera bifasciata, Baarn, Noord-Holland, Netherlands, 13 March 1998 (Magnus Robb & The Sound Approach). Flight calls. Above: White-winged Crossbill Loxia leucoptera leucoptera, Sólbrekka/Seltjörn, SW Iceland, 15 November 2017 (Gunnar Thór Hallgrímsson). Trumpet calls. Above: White-winged Crossbill Loxia leucoptera leucoptera, Algonquin Provincial Park, Ontario, Canada, 3 August 2000 (Magnus Robb & The Sound Approach). Trumpet calls. Above: Two-barred Crossbill Loxia leucoptera bifasciata, Huizen, Noord-Holland, Netherlands, 2 February 2003 (Magnus Robb & The Sound Approach). Trumpet calls. This represents the first record of leucoptera for the Western Palearctic. Given the consistent differences displayed in biometrics, structure, plumage and vocalisations between the two forms, Nearctic leucoptera and Eurasian bifasciata appear to be good candidates for treatment as separate species. More information on the two forms, including excellent artwork by Ian Lewington, can be found in British Birds 100: 650–657. White-winged Crossbill Loxia leucoptera leucoptera, Sólbrekka/Seltjörn, SW Iceland, 15 November 2017 (Gunnar Thór Hallgrímsson). Constantine, M, & The Sound Approach. 2006. The Sound Approach to Birding. The Sound Approach, Poole. Harrop, A H J, Knox A G & McGowan R Y. 2007. 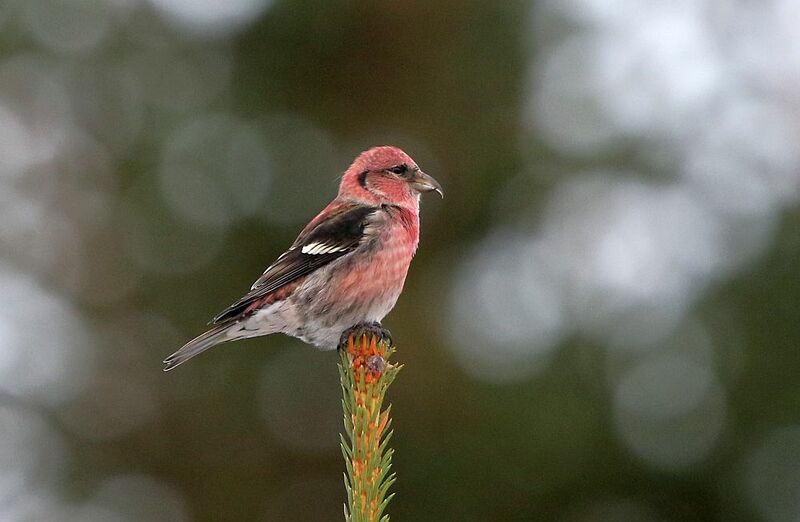 Britain’s first Two-barred Crossbill. British Birds 100: 650-657. The Sound Approach. 2017. Online; available at: https://soundapproach.co.uk/ [Accessed 15 Nov. 2017].